The Fairfield Athletic Boosters drew the winning ticket of their All Star Game Ticket Raffle on Monday, June 15th at office of Southern Hills Community Bank in Leesburg. 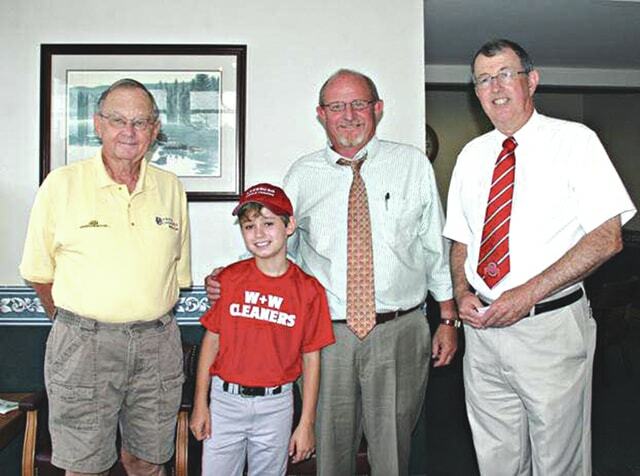 Owen Larrick dressed in his baseball uniform selected the winning ticket shortly after 12:00 noon in front of several booster members, bank employees, and Jeff Cloud, CEO of Southern Hills Community Bank. The winning ticket was Ticket No. 047 held be Becky Haag of Hillsboro. Becky was contacted by phone shortly after the drawing and was excited to hear the good news. The real winner was the Fairfield Athletic Boosters organization thanks to the generous donation of two tickets to the 2015 Major League Baseball All Star Game on Tuesday, July 14th at Great American Ball Park in Cincinnati by Southern Hills Community Bank. The raffle tickets were sold for $ 20.00 per ticket. The Fairfield Athletic Booster members and Fairfield Coaches sold 409 total tickets and raised $8,180 for Fairfield Athletics. On behalf of the Fairfield Athletic Boosters, Tom Purtell, President and Mary Beth Hodson, Treasurer wished to thank everyone that bought a ticket or sold a ticket. The support of our Fairfield student athletes by the community is truly impressive.